Pallas Athena, the Goddess of Truth, is a tremendous being of light who ensouls the cosmic consciousness of Truth. The flame of truth is an intense bright emerald green. It combines the flaming blue power of God’s will and the brilliant golden illumination of the intelligence of God. Her presence in the universe is the exaltation of the flame of living Truth. This truth she holds on behalf of the evolutions of earth as a member of the Karmic Board, where she serves as the representative on the fifth ray of truth, healing, supply and precipitation. The one who holds the office of the Goddess of Truth has always given great assistance to the messengers of the Great White Brotherhood. Her scepter of power is the flaming sword of Truth that cleaves asunder the Real from the unreal and keeps the way of the Tree of Life in the Garden of Eden. Pallas Athena was embodied as the high priestess in the Temple of Truth on Atlantis, serving under Vesta. She later kept the Mother flame of truth in ancient Greece, as that temple and that temple flame were transferred from Atlantis to that land. She served as directress of the temple virgins and oracles at Delphi, who were messengers of the gods and goddesses who spoke Truth and the wisdom of the Law to the ancients. Pallas Athena and the members of the Brotherhood sought to keep alive the inner mysteries of the retreats. The memories of the gods, the functions of the temple virgins and the oracles of Delphi were the last vestiges of communication from the ascended masters in the Greek culture. After the closing over of those sources due to the discord and rebellion of the people, we begin to trace modern thought reaching and culminating in what manifests today as humanism. Pallas Athena is the twin flame of the Maha Chohan, the representative of the Holy Spirit to the earth. Together they are an indomitable pair in defense of truth. The Maha Chohan was embodied as the Greek poet Homer, who spoke of Pallas Athena in his epic poems, the Iliad and the Odyssey. Pallas Athena is one of the most important deities in Greek mythology, and in Roman mythology she is identified as Minerva. Her influence spans everything from the administration of government and militaristic pursuits to the delicate arts of spinning and weaving. She is seen as the very personification of wisdom who presides over the intellectual and moral side of human life. Athena was the heart of the spiritual life of ancient Athens. The Greeks adored her as the defender of their cities and honored her with many titles. She is revered as the Goddess of War and Peace, the Goddess of Wisdom, patron of arts and crafts, and guardian of cities. She is also honored as the inventor and protector of culture and as the protector of civilized life and agriculture. She has been called the Counselor-Goddess and Goddess of the Assembly for her role in maintaining law and order in the courts and administering justice. She is also looked to as the Goddess of the Working Woman because of her mastery in spinning, weaving and needlework. Among the many inventions attributed to her are the plow, the rake, the flute, the ship and the science of numbers. Her emblem is the olive, emblem of peace; and her bird is the owl, representative of wisdom. Athena is popularly admired as the “martial maiden” who inspires and accompanies heroes in their adventures and battles, yet never succumbs to amorous advances, fiercely defending her virginity. She was one of three virgin-goddesses who could not be stirred by the influences of Aphrodite, the Goddess of Love. One of the earliest accounts of Athena appears in the Iliad, where she is a war goddess, inspiring and fighting alongside the Greek heroes. To possess her favor is considered synonymous with military prowess. According to the traditions of Greek mythology, Pallas Athena was the favorite daughter of Zeus, the powerful father of the Gods and king of Mount Olympus. Her mother was the Goddess Metis, whose name means “thought” or “intelligence.” Metis was believed to be so wise that she knew more than all the gods and men together. Zeus was warned that if he had children with Metis they would be more powerful than he and would eventually dethrone him. Thus, when Metis became pregnant with Athena, Zeus swallowed Metis in order to prevent the child’s birth. Soon after, Zeus became afflicted with a violent headache. He went to the smithy god Hephaestus, who split his skull with a bronze ax in order to relieve the pain. Out sprang the bright-eyed Athena in full armour, shouting triumphantly and brandishing a sharp spear! The birth of Athena from the head of Zeus can be seen as symbolic of her rational temperament. Her very nature reflects the triumph of reason over passion, as she is consistently unmoved by the emotions of passion or romantic love. Her father is the most powerful and her mother the wisest of the gods and goddesses. Athena is thus a product of the union of power and wisdom. To the Athenians, she was known as Parthenos, which means “Virgin,” or “Maiden.” They built the Parthenon in her honor on the Acropolis at Athens. The beautiful Parthenon was one of the largest Greek temples and a masterpiece of Greek architecture. It was the spiritual center of Athens. 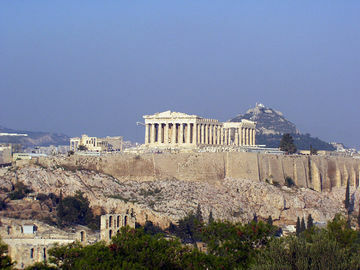 Built on a high hill, it was visible for miles around and stood as a symbol of Athenian culture, wealth and power. Inside, toward the west end, towered a forty-foot-high ivory and gold statue of the goddess, sculpted by Phidias. In art, Athena is represented as a stately figure, clothed in armour and bearing her breastplate, the aegis, which no arrow could pierce. The aegis is ringed in serpents and is adorned with the head of the Gorgon Medusa. Athena often wears a golden helmet and holds in her right hand a spear to strike at a serpent near her feet. It has thus been said that she wields the spear of knowledge against the serpent of ignorance. To the ancient Greeks, Athena was known as the Spear-shaker. They placed her statue on their temples, and when the rays of the sun would dance on her spear, it looked as if she were shaking it. I AM Pallas Athena. I AM Greek. I AM Roman. I AM freeborn. I AM a member of every nation. I AM an American. From this day and forevermore, I claim you for the cause of Truth because you have made that cause your own. In the living flame of Truth, I am grateful for your love of Truth, of liberty, for your courage and your self-sacrifice. I am grateful, and I bow before the flame of Truth within you. And I will use that flame to light a nation and to light a world! As a result of this dictation, Pallas Athena, Saint Germain and El Morya sent the messenger and their chelas throughout the world to bring the truth of the message of the ascended masters. Pallas Athena ministers to mankind from the Temple of Truth above the Island of Crete. Serving directly under Vesta, the Sun Goddess, she focuses the truth of God’s love to the earth. She also works with Hilarion, the chohan of the fifth ray, and other healing and green-ray masters. Souls come to the Temple of Truth in their finer bodies at night (during sleep) to be instructed in the fine points of cosmic law, the science of healing, mathematics, music, divine geometry and the laws of alchemy and precipitation. Many who come to society today with ingenious ways of opening the doors of higher understanding in these fields have studied under the masters in this retreat. Whenever you are engaged in a service to the ascended masters, call to Pallas Athena and her legions of Truth to go before you, to be the bearer of the mighty sword of Truth for the binding of the force of anti-truth or Antichrist. ↑ Pallas Athena, “America: Ye Shall Know the Truth and the Truth Shall Make You Free,” Pearls of Wisdom, vol. 44, no. 17, April 29, 2001. This page was last modified on 16 August 2016, at 15:29.